Cambridge's founder led the independent BD industry to the promised land of fees. Now hes leading them to succession planning nirvana. 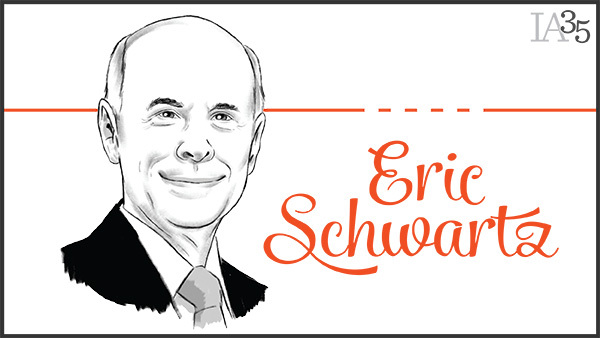 Many—most—advisors still don’t have a formal succession plan, but Eric Schwartz does, for himself and for his broker-dealer reps. Many advisors are struggling with the best revenue model for their businesses, since robo-advisors are putting price pressure on advisors whose “value” comes from picking a diversified portfolio of actively managed mutual funds while commissions are drying up. Eric Schwartz’s Cambridge Investment Research broker-dealer is not confused by revenue models. The now-34-year-old Cambridge with 2,700 reps was a pioneer in promoting fee-based business in the independent broker-dealer space; as of year-end 2014 (according to data gathered for IA’s annual broker-dealer survey in June), Cambridge had $36 billion in AUM in its fee-based business, delivering $332 million in revenue. Schwartz got his start in the investment business at a young age. At 10, he bought his first stock, he said in a May interview, “and gave my father his first hot stock tip.” As an adult, Schwartz became a “small syndicator” of oil and gas partnerships for 10 years, forming ENRIC Financial Services “to allow me to distribute my partnerships” mostly to broker-dealers. Following Ronald Reagan’s tax reform act in 1986, the partnership business dried up, and many broker-dealer reps who sold them went out of business. But in 1992, Schwartz started his own broker-dealer, recalling that those reps “were averaging $25,000” in annual production then. To make more money, “I figured maybe I should focus on financial planning, so I started recruiting reps,” he said. While overall production increased sharply, to $2 million in 1995, he realized that “just selling mutual funds in Iowa didn’t seem like a long-term business model.” Instead, he decided to go after reps who were doing fee-based business. “Most BDs didn’t do fees then, maybe it was only 1% of the total business” of broker-dealers. But he said that in talking to reps who were doing fee work, “I discovered these were entrepreneurial people,” and “kept calling my attorney to ask ‘What could we do?’” to accommodate them. He says now that it was by “listening to the reps—what all BDs should be doing—that I was closing 50% of more of fee advisors” that he attempted to recruit. “I’d like to say it was my brilliance about fees, but it was really the one niche nobody was doing,” he jokingly recalls now. “I coined the term ‘The Fee Experts’ in our advertising,” and the business took off. In addition to downplaying his own marketing acumen, Schwartz also gives credit for his firm’s early success to, of all people, Charles Schwab & Co. After starting to focus on fees, he said, “a guy called me up and said I was referred to you by a guy from Minnesota who worked at Schwab but also wanted to do commissions.” So in those years “referrals from Schwab represented 75% of our recruits. We were solving a problem they [the custodians] had, and we didn’t force them to drop” their custodial affiliation. “I was an opportunist,” Schwartz called himself, and while he “couldn’t compete with LPL at the time, I’d rather have an 80% close rate on 2% of the reps” in recruiting than the reverse ratio. Now, Cambridge Investment Research’s “growth rate is more controllable; we average 15% a year growth.” That growth allows Cambridge to “attract a lot of talent from other BDs because we’re growing and making decisions on our own—not waiting for the mother ship to decide on a budget or whatever,” he said in a mild rebuke of non-independently-owned IBDs. “Some advisors come to us today and think of us as a small firm (if they’ve come from a bigger firm)—but I still block off time on my schedule to talk with advisors every week,” Schwartz said. Schwartz said it was his work “on my own succession plan that led to the logic” behind CPG as a succession planning option “for my 2,700 ‘clients,’” meaning advisors and the 600 Cambridge branches that he said report directly to the home office. The next generation of leadership at Cambridge itself is already in place, notably in the person of President Amy Webber, while Schwartz’s succession plan includes a structure that will keep Cambridge in private hands. See the full 2015 IA 35 for 35 and the calendar for extended profiles of each honoree.